When I sat down recently with three City of Hillsboro planners—Don Odermott, Transportation Planning Engineer & Manager; Brad Choi, Transportation Planner; & Ally Holmqvist, Senior Long Range Planner—I was expecting just to discuss adding painted-on bike lanes to a little road called NE Imbrie Drive that’s set for a widening. Instead, I got a lesson in bikeable street grids and irony: Portland’s most sustainable modes of transportation, walking and biking, are set up to succeed in large part because they occur on a foundation of terrible environmental practices that are no longer allowed in Oregon. Dredging and filling of waterways was nothing new in the 1840s, when Portland, Oregon came along. But what wasn’t known to the Europeans immigrating to Oregon was how their wetland and swamp filling affected salmon—or maybe they were just too busy clearcutting to notice. Either way, here’s what went down, from a transpo-enviro perspective. I should begin by saying I used to be a downtown Portland bike commuter. It’s where I learned to ride a bicycle side-by-side with cars in an urban setting. Portland’s street grid is perfect for easy and creative bike commuting, with its short blocks and narrow streets. It’s the same with other downtowns formed the same era, including Hillsboro’s, with its own small grid of 200 X 200 foot blocks. The difference is, Portland went in an urban direction and grew steadily, while Hillsboro stayed small and rural up to the 1970s. While living close to downtown for grad school in the early 2000s, biking soon began to feel easy, but a move to North Portland gave me a 5-mile one way commute to my downtown job by way of N Interstate Ave, aka Pacific Hwy West. Interstate has painted bike lanes next to heavy diesel truck and auto activity on either side of the MAX light rail tracks. Though I left a puddle of blood from my chin on the middle of Interstate once—my rite of passage—Interstate still felt kinder than the arterial further west. North Greeley Ave felt more like biking the shoulder of U.S. Hwy 26, or SW Murray Blvd past the Nike woods. Note: locally we call the 26 the “Sunset Hwy,” as if the ever-widening highway is just a lovely stroll down a sandy beach. Since moving out of Portland altogether, to Washington County, I still use a bicycle as transportation. Since 2010, I have not owned a car. Especially in the suburbs, this often leaves me feeling like a social outlier. It’s also sometimes annoying that most people commuting to jobs here, whether they live in the county or not, drive alone to work in their cars every weekday instead of taking the bus. All those cars’ noise, speed, smells and glare make my form of transportation, walking and biking, all the more stressful. Biking also felt lonelier here at first; I missed seeing many people on bicycles. Maybe people biking Portland’s outer east side or in SW know the feeling, too. I missed Portland’s downtown street grid, which is not at all the norm in my new county. Adjusting to Washington County’s transportation system, the basis of which is 45mph arterials with painted-on bike lanes, took some doing. Cars and trucks barreling by at 45-50mph with ice storm gravel lingering in the bike lane feels and sounds a lot different than cars at 30mph. Also, the intersections are tremendous in size. 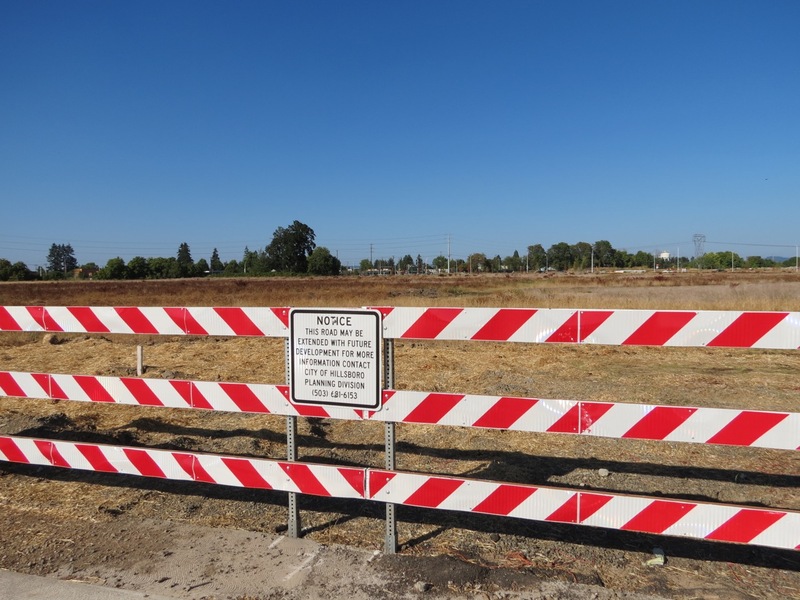 Walker Road at SW Murray Blvd is almost half an acre now, and it’s set to be widened even more. NE Cornelius Pass Road at NE Evergreen Pkwy is 0.8 of an acre. That’s almost the size of one Portland city block! How much housing fits on one Portland city block? And get this: from that intersection, just 1/3 of a mile of Cornelius Pass is FIVE whole acres of land. That could grow a lot of veggies! Or it could house a lot of people in apartments. For a six-foot bike lane to equal five acres, it’d have to stretch out to nearly seven miles. On these vast, fast roads, turning left on a bike can be a nail-biting, teeth-clenching experience. Worse, when I first arrived, the bike lanes weren’t being kept clean and maintained year-round. That may change as of November 2018’s election; we have a new county chair, Kathryn Harrington, who supports transit and bikeability. With the east end of Washington County rapidly urbanizing, residents expect multi-modal options and are electing leaders who respond to their needs. The cities are also responding to the demand with new policy. Of course, when one’s first taste of city biking is Portland, it’s hard not to compare every other place to it. Portland’s compact street grid is made up of many parallel streets granting countless paths to a destination. The opposite is true in Washington County. Here there are many fewer routes between two points because of a heavy dependence on big collectors and arterials, some of them along centuries-old routes that wound around swaths of marshy land. In the 1800s, immigrants improved and used these routes to deliver goods to Portland in ox-drawn wagons. But cities and roads in Washington County didn’t see considerable development until after Intel and other high-tech employers began arriving in the 1970s. It so happens that 1970 is when the U.S Environmental Protection Agency (EPA) was created, by President Nixon (yes, that Nixon). The Clean Water Act (CWA) of 1972, a major amendment of the nation’s first water pollution regulation act from 1948, followed. Federally, Section 404 of the CWA regulates the dredge and fill of bodies of water in the United States with a permitting process. A number of agencies oversee the regulation of these laws, including the U.S. Army Corps of Engineers, the EPA (which has policy on consultation and coordination with tribal governments), the U.S. Fish and Wildlife Service and National Marine Fisheries Service, and the National Tribal Water Council. Now, despite their differences, both Portland and Washington County are facing the same transportation impasse. Neither can feasibly add more roads, and both are dealing with ever-increasing traffic congestion. For the suburbs, introducing multi-modality is a strong solution. But attracting more people to biking on existing suburban roads is challenging. First, the idea has to occur to people. Often, this is from seeing other people biking instead of driving. But to act on that idea, biking needs to seem safer for those who are new to it. Even experienced riders find fast, wide arterials like Murray Blvd unpleasant. For people still getting used to biking on streets in close proximity to cars, wide arterials can feel harrowing or even psychologically prohibitive. One of the tricks to developing better biking facilities where the mode share’s still small is for planners to communicate with the people already out biking. I was very happy to accept Hillsboro’s invitation to be part of a bicycle work group helping to identify solutions and concepts for the latest revision of their Transportation System Plan (TSP). Our input can help conceptualize everything from cycle tracks (now standard in Hillsboro) to the surface applied to a multi-use path. 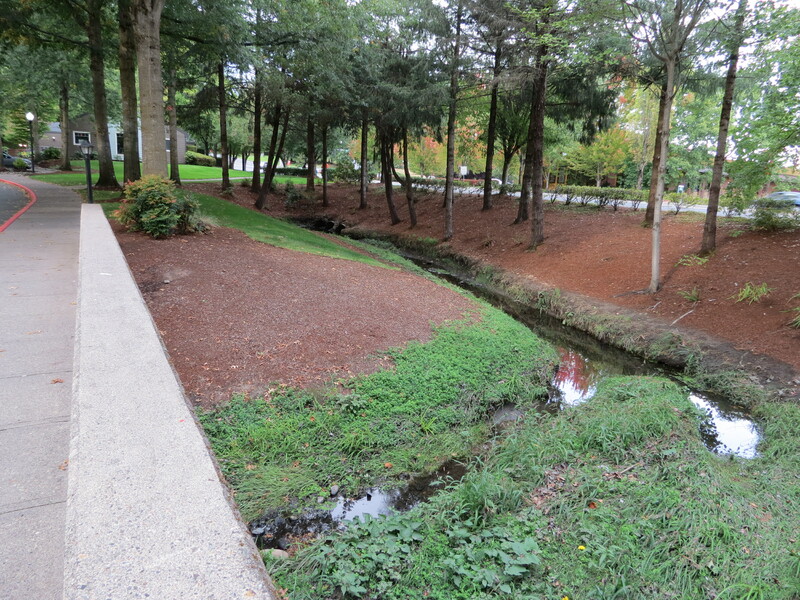 Surface treatment—like pavement versus bark chips—is an actual concern right now with Hillsboro’s Crescent Park Greenway, which will connect urban employment centers with neighborhoods and more. It still hadn’t occurred to me to question why Portland was built the way it was in the first place—roads were just built differently in the 1800s & early 20th century, right?—but I did wonder why Washington County arterials were being continually widened, if the county really wanted to encourage cyclists here. The City of Hillsboro’s idea is to identify a low-stress biking network they can map and sign, as well as add or improve bike facilities on certain streets in their jurisdiction. There are arterials through their city that are in state or county jurisdiction, like the huge NE Cornell Road, which loses its bike lanes altogether just before going through downtown Hillsboro. But the lower stress alternative for Cornell, NE Veterans Drive, is Hillsboro-owned. Ramp-protected bike lanes are now installed on Veterans, from NE Brookwood Pkwy up to where it becomes NE Grant Street. Grant to 5th to Main works great to get downtown, then, surprise! Small downtown Hillsboro has a patch of biking very similar to downtown Portland’s. Both grids were in place by the late 1800s, but Hillsboro’s grid stayed small, like the downtowns of many farming communities across the west, some of which consisted of a single Main Street. 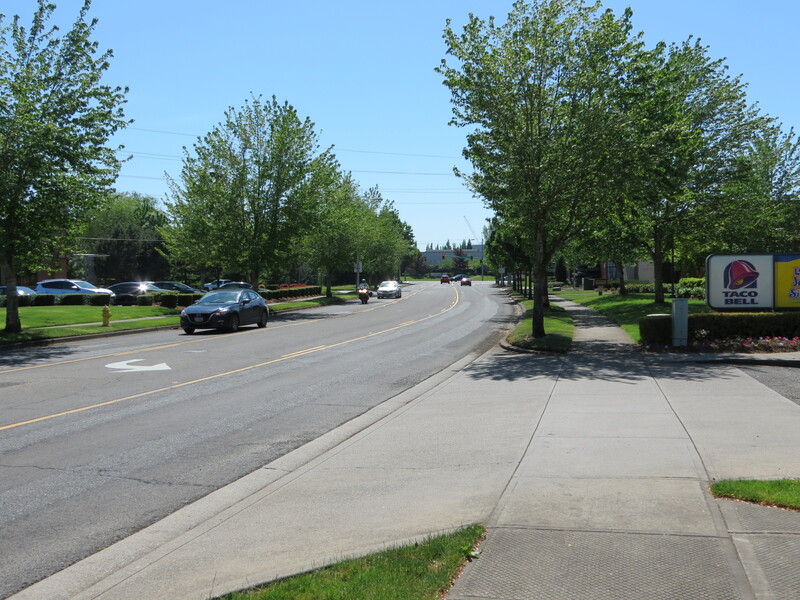 Determined to help Hillsboro identify roads that seem like “low-hanging fruit,” that is, obvious places to add support for bicycles, such as short connector roads leading to businesses residents need to access, I contacted city representatives to discuss NE Imbrie Drive. The road, which lacks any bike facilities, goes past the old Imbrie family farmstead house, which is on the National Registry of Historic Places. McMenamins runs a popular restaurant and wedding facility there, the Cornelius Pass Roadhouse, on the site of the Imbries’ 1840s land claim settlement. Imbrie also gets a mention in Washington County’s 2015 TSP in a list of roads their travel demand models say are congested. Note: local governing bodies each have their own TSP, and they’re revised once a decade or so. Imbrie seems ideal for a calming treatment. Too many people in cars are using Imbrie as a shortcut from one vast arterial to another, but the street is really needed to deliver local residents to their grocery store, businesses and restaurants, including the aforementioned McMenamins. My advice, after trying to bike this road a few times? Take a look; any other ideas on how to increase biking or transit use on Imbrie? During our meeting, I learned one reason Hillsboro hadn’t considered adding bike lanes on Imbrie is because of all the driveways, which intersect the existing sidewalk. I didn’t ask how common that reason is in transportation planning, but I couldn’t help but wonder if driveways have been used for decades to excuse lack of bike facilities (not just here, but throughout suburban America), whenever there’s avarice from certain stakeholders to prioritize auto throughput. What it’s saying is that people are not entitled to safety modifications on a street with driveways if they are using a bicycle. To me, an Oregon taxpayer who has biked on Imbrie, it’s unclear why cars, but not bicycles, are being allowed on this facility, where decisions must be made how to handle driveway risk. Combined with people speeding between arterials, the driveways actually make the addition of bike facilities—even if just paint—feel more imperative when I ride on Imbrie. The people I’ve observed biking Imbrie (which might appear to be a lower-stress street from a map) are choosing to bike on the sidewalk. But sidewalk biking is notoriously dangerous across driveways. On a sidewalk, people on bikes are less obvious or expected by people driving. Lack of bike facilities here puts too much of the safety risk mitigation on the person biking, which is not an attractive mode feature. Short of building a new bike-friendly or bike-only street from Evergreen to the Fred Meyer grocery store, the alternatives here for those not using cars are: 1) taking the lane on one’s bicycle; 2) riding the sidewalks; or 3) turning around and not shopping or eating out in that location. Hopefully, as in other parts of the city, short and long range planning of Imbrie will become multi-modal. Buses as well as bicycles—not just auto and freight traffic—need to be brought creatively and determinedly into the transportation system plan. People who live, walk, bus and bike need access to their local grocery store just like people using cars. At non-peak hours, county arterials’ dark surfaces bake in the sun, sitting almost empty on summer mid-mornings and mid-afternoons. They’re also practically deserted at night, which makes them ripe for speeding. Portland’s narrower streets seem so much safer for people, though all the space dedicated to autos may now seem a terrible use of land. In the suburbs, instead of plans to constantly widen roads in anticipation that everyone, their kids, and their kids’ kids will exponentially keep driving cars, new bus lines should be regularly forecast and funded. And buses should be going round the clock to and from Washington County’s enormous campuses that employ thousands of people, often 24/7. It’s not just high-tech employers, but Nike, Resers, Portland Community College, and many more places that attract thousands of people every day. I asked the planners about this. They admitted that when people move here from regions where transit is the norm, they ask: “where is the bus service?” But it seems winning transit, bus transit in particular, is a complex collaboration between many stakeholders. Clearly, if bus service were improved, congestion would go down, as would our carbon emissions. Indeed, as California and Oregon burn through our increasingly hot summers, even as those with a vested interest in the fossil fuel industry deny cause and effect, the rallying call for climate change mitigation is now being shared by the public and elected leaders alike. It’s finally becoming a campaign issue, with no time to spare. Transportation is the greatest contributor to greenhouse gas emissions in Oregon, with gasoline, diesel and residuals the largest contributors among transportation-related fuels, according to the Oregon Global Warming Commission. In May 2018 Oregon Business magazine reported, “transportation is Oregon’s largest in-state sector of emissions,” back on the rise after a post-Great Recession leveling off. “Bicycling is great because we can go ahead and put in the infrastructure that we hope people will use,” Odermott said. That’s exactly what was done with the new South Hillsboro development, the three planners told me. The new housing development was designed to be multi-modal from the outset. “It’s great to be able to design a project from scratch, because we can plan for bus and bicycle facilities from the beginning. If we could get 12-15% of people biking to work, that’d be a smashing success,” said Odermott. Our conversation was shifting from Imbrie specifically to climate and environmentalism generally. Planners explained that the EPA requires permits for work in wetland areas, and it’s not always easy to justify connecting roads if a bridge will be required. Not only the city, but everyone, from farmers and loggers to companies like Nike to housing developers, must apply for permits. Take a look at the recent applications in Washington County. Don Odermott told me that virtually all creeks in Hillsboro are fish-bearing and subject to full environmental regulations to assure safe fish passage. “Crossings of creek corridors are subject to federal and state environmental requirements, which start with having to prove why another crossing is required. Would widening an existing one meet the needs? As such, we have to be very purposeful where we put the crossings,” he said. It’d be worthwhile for the public to examine what our “needs” are perceived to be, since our needs determine the expectations we place on local government and how it spends money. Do we “need” to provide enough streets and parking for growing future generations to use their own personal cars someday? Or do we need to make our move now, to travel modes we know will drastically curb our carbon emissions and preserve our own futures? We can keep paying to build road capacity for future people we don’t even know will want to use cars, or we can save ourselves from costs of climate change. Back to crossings, Brad Choi pointed out that Portland has—or had—the same wetlands habitat we have in Washington County. It’s just that Portland developed before environmental protections were in place. If Portland had developed after the 1970s, its road system might look a lot like Hillsboro’s—fewer roads, and wide, to fit as many cars as possible through fewer crossings. Choi referred me to a book called Portlandness, which has a section about Portland’s lost and forgotten waters. It briefly tells the sad tale of Tanner Creek, named for the tannery that once stood near the stadium home of the Timbers and Thorns. 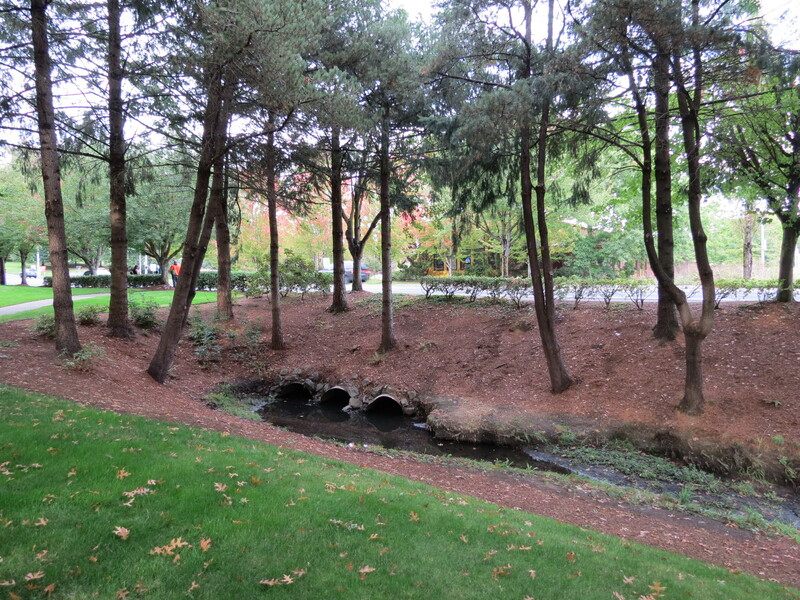 Tanner Creek is now just a phantom of itself, after being piped and culverted to its final resting place at the Willamette, no more a home to trout and crayfish. I suddenly saw Portland’s Platinum Bike League ranking in a new light, as it dawned on me what the planners were saying: the Portland street grid on which I’d learned to bike-commute, and had forever used as a basis for comparison, was bought at a big cost to the environment. Crossings were put anywhere deemed necessary, and marshy, muddy areas were filled in wherever it was convenient for wagon wheels and tires. It’s a little jarring that bicycles now find the friendliest streets in the country where salmon no longer spawn. Today, Portland’s bikeability is also becoming endangered, as its grid capacity fills with cars. Activists’ hard-fought battles against new freeways kept that from happening, for the most part, throughout the 20th century. But today, with supposedly respectable business groups fighting against adding the bicycle facilities needed for safer road sharing in the crowds of traffic, 2020 could be the start of a grim decade. It’d be all the more heartbreaking to see Portland’s arguably most sustainable travel mode buried, just as the first Portlanders buried the streams and wetlands. If Portland’s bike-friendly grid is a result of developers killing wetlands with dirt fill and industrial waste, then Washington County’s lack of low-stress biking and walkability is partly because its cities developed too late to simply “fill” wetlands to add roads and crossings wherever they wanted (that, combined with single-mode planning). A grid of short blocks with frequent crossings will never be justified here. Salmonid streams in particular are protected now, and Washington County has many. Strange to think that timing is a reason Washington County’s wetlands are not all filled in with roads today. Strange too that timing may be a reason Portland’s so bikeable today, while urban unicorporated Washington County is less so. Part of the irony is that Portland, not its suburbs to the west, usually gets all the credit for being home to the most environmentally progressive people in Oregon. But wherever or whenever the environmental protectors arrived, it’s a good thing they got there when they did. 1840s: In Eugene E. Snyder’s thorough history of Portland’s old streets, Portland Names and Neighborhoods, Their Historic Origins, he reminds readers that Portland’s first street grid was 16 blocks and was laid out in 1845 by Portland founders Asa Lovejoy and Francis Pettygrove, shortly before Portland was incorporated in 1851. Another interesting tidbit: the now tree-lined Ladd’s Addition subdivision was platted in 1891. It was still farmland, but treeless as all the indigenous fir forest had been cut down. Those tall trees there now? Planted by the suburbanites of the time. 1902: As the new trees grew and one century rolled into the next, the National Reclamation Act of 1902 was passed by Congress. This was to fund irrigation in arid lands, especially in the far west, including Oregon. 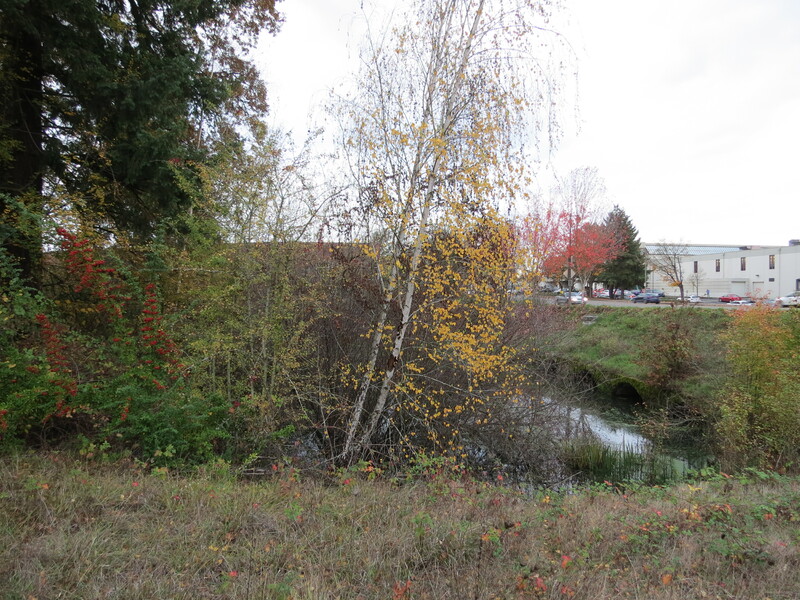 It allowed Portlanders to ramp up the process of draining and filling wetlands for their city’s continued development, and to divert, retain and transmit water for various settlement purposes. 1913: In 1913, when the Oregon State Highway Departmement was formed and Pacific Highway was initiated, there were still only 25 miles of paved roads in the whole state, according to Oregon’s Main Street: U.S. Highway 99, “The Stories.” But by 1928, with the help of federal dollars, Pacific Highway became U.S. Highway 99. Portland’s Grand Avenue and Martin Luther King Blvd, which end up at the Interstate Bridge over the Columbia, are part of the now decommissioned U.S. Highway 99 (it was replaced by the I-5). 1930s: Ash and debris from the City of Portland’s incinerator were used to fill wetlands and slough channels in the St. Johns Landfill. For a long time, maybe up to the 1950s when the population suddenly increased by 22%, it seems little effort would’ve been needed from the City of Portland to help bicycles thrive as transportation. The main thing people would’ve needed from city policy it seems, would have been management of the number of autos—not letting the capacity get too full—and filling potholes. 1960s: The Port of Portland, which was originally created in 1891 to dredge and maintain a shipping channel to the ocean, began filling Smith and Bybee Lakes with Columbia River dredge sands and the mid-dike levee was constructed. 1967: The Oregon legislature enacted Oregon’s Removal-Fill Law to conserve state waterways and wetlands and began requiring state permitting for dredging. Permits to fill Smith and Bybee below the contour line were prohibited. 1970s: Port of Portland constructed new terminals, including Terminal 6, used for automobile shipping; truck traffic increased in Portland. High-tech companies came to Oregon, forever changing what was still mostly farmland west of Portland. As the environmental protection movement picked up, Section 404 of the Clean Water Act gave us our wetlands protection, marking the end of compact street grids in wetland-rich areas, since funds are usually insufficient to allow for bridges. Activists in Portland stopped the Mount Hood Freeway. The U.S. government responded to growing concerns about loss of wetlands by establishing a policy of “no net loss” under George H.W. Bush, which was continued with the Clinton administration’s 1998 Clean Water Action Plan that aimed for a net gain of 100,000 acres of wetlands per year. 1994: The March 1994 Final Environmetal Impact Statement on the Hillsboro Extension of the Westside Corridor is published. The study is just one example of a what is now required to determine environmental consequences and mitigations of development. Section 5-68 of that report says, “Culverts would be installed in sufficient size, number and location to maintain natural stream flows and avoid either flooding or draining of wetland and riparian areas.” It also states that if more than a small amount of wetland fill would be required for a particular area, a bridge would be recommended for construction, at a much higher cost. 2008: Portland’s first green bike boxes started appearing. Deliberate bicycle infrastructure was definitely now needed and was being built during Mayor Sam Adams’ term. 2011 to today: The show Portlandia made its debut in 2011. Some people were recovered from the Great Recession (but not all. Not by a long shot). Keeping personal cars at bay in Portland was no doubt easier before the post-Portlandia, post-Great Recession population explosions. Since 2003, when a Smith & Bybee Wetlands water control structure was replaced with one that lets fish through, residents have been able to watch the Wetlands come back to health in real time. The project offers Portlanders an idea of what their city might look like if wetlands had been protected throughout Portland’s development. But to see healthy wetlands that were protected, Portlanders can also take the MAX light rail out to Washington County, where wetland trails and bridges over marsh areas offer walks alongside old trees and vegetation, home to an assortment of birds and wildlife. It might be tempting for people who are switching from driving cars to think these wetland trails and bridges can be used for bike-commuting. However, they’re not ideal for that. First, these often winding trails are multi-use. People are walking & jogging on them. But also, trails can’t always be lit for night and winter riding, as the lights disturb wildlife. That’s one of the things I love most about living in Washington County: environmentalists have taken great care to ensure protection of our wetlands wildlife. Access to wilds and nature within walking distance of neighborhoods feels vital to me personally—as vital as I know it is for overall human health. I just wish bicycles as sustainable transportation had also been planned for all along. Rather than try to convince bike-commuters to use meandering trails built for recreation, or forcing us to accept the width & speed of arterials as an unlikely compromise for protecting the environment, a significant change in mindset about road design needs to happen, just like the change that ended automatically filling wetlands. The potential of cars to destroy our climate, combined with the potential that non-car modes have as climate protectors, is too great to dismiss. The suburban mindset must shift to believing that those who switch to riding bicycles as transportation should have as much (if not more) access and safety on streets as they’d been experiencing when driving a car. Also, riding the bus should become easier, while driving a car should become harder, more expensive, and inconvenient. We can add sidewalks and bus shelters, and open all the crosswalks so people can more efficiently walk to stops; we can narrow traffic lanes and add missing bike lanes; we can remove on-street and free parking. We can stop approving the hefty budget to widen any more roads. But how to convince today’s suburban cities to design roads that aim to retire their community’s reliance on autos? How can we make a case for ditching the old plans—the ones that still project and allow for ever-increasing car use in urban areas? How can we help planners conceptualize roads that align even more with our environmental values and laws, and convince the remaining old-fashioned transportation planners that cars for every individual commuter are the wave of the past, not the future? After all, along with the environmental devastation of filling wetlands to make them drivable, autos themselves are terrible for the environment, with their oil run-off into streams, and emissions polluting the air. Whenever I attend transportation project open houses, those questions float through my mind as I try to suss out where prioritization of auto throughput is endangering vulnerable modes. For example: are fewer but wider arterials any better for the environment if their designers are trying to move exponential numbers of autos, treating bikes, buses and walking as an afterthought? Could keeping our fewer roads narrow and modifying them to attract more people to comfortably bike, actually be a better move for the climate as well as freight movement? Are assumptions about future car ownership accurate? Should car ownership be over-planned for, at the expense of those who don’t use cars even now, who instead use buses, bikes, or e-bikes? On one hand, I feel pride and satisfaction that development in Washington County has had to take care to bridge and culvert streams in a living way. And I’m thankful residents have resisted building certain roads, like the “westside highway.” There are still a few highway dreamers, like Richard Vial, who recently lost reelection to the legislature, who don’t give up, but the opposition to a future of more roads and cars is fierce from environmental, social and transportation justice advocates alike. On the other hand, I wonder if the building of fewer but wider arterials will still come an at environmental cost to Washington County, since car throughput was still being prioritized over the years, leaving many people afraid to bike. Through an environmental protection lens, one can almost understand the logic of building fewer but wider roads to protect wetlands. But more logical would be designing for smaller, thinner vehicles, like bicycles, and efficient vehicles, like buses, for frequent trips within an area. Maybe it’s been hard for a community that was still out in “the country” as recently as 50 years ago to admit that most residents aren’t hauling huge farm equipment around Cedar Mill or Beaverton anymore. Accordingly, traffic lanes can be shrunk to Prius size. At least nowadays, any time the belt around urban growth boundaries is let out a notch, land development requires special permits for work on wetlands. It’s nothing like Portland’s early days, when dredging and filling was unregulated—even encouraged—and culvert pipes didn’t have to be bottomless or allow fish through. 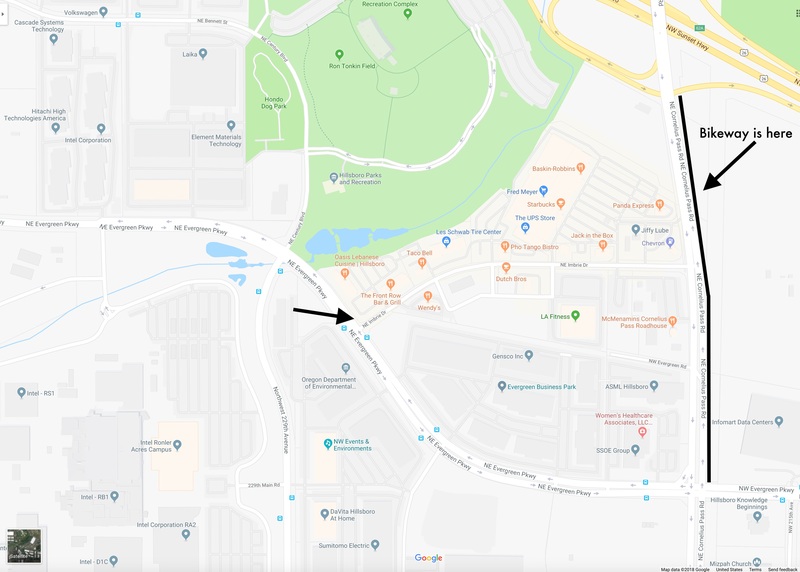 As mentioned, Hillsboro has ramp-protected bike lanes on Veterans Drive near the Airport MAX, where there is no on-street parking and riders can easily drop into the larger lane in order to make a left turn. 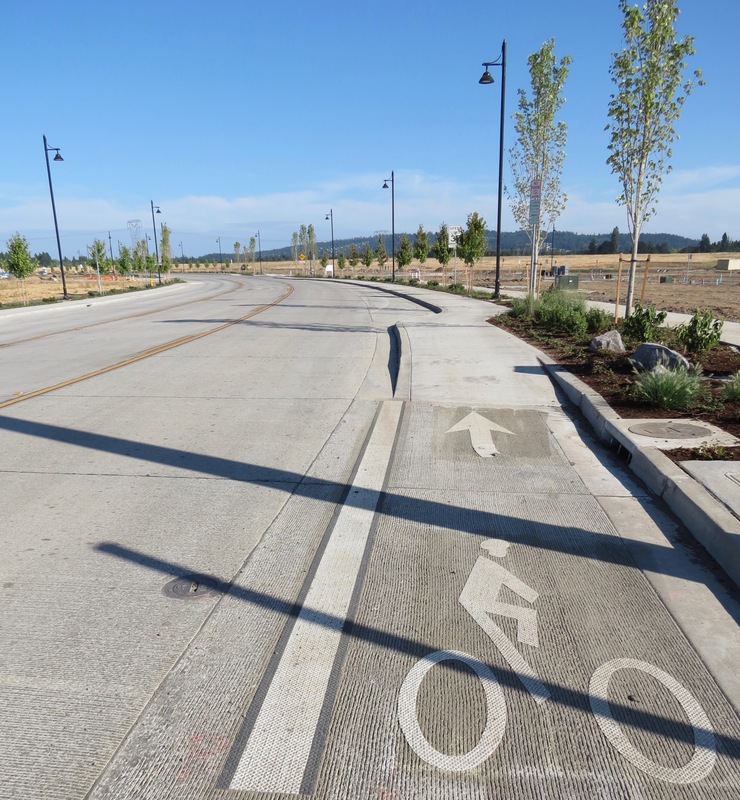 And South Hillsboro’s brand new development has even newer cycle tracks. They are a curbed bike facility that look and act almost like a sidewalk. I rode them this summer—they’re on SE Blanton Street between SE 67th and SW 209th Ave—and they definitely do feel safer next to the cars that were whizzing past, being driven well above the new road’s 35mph speed limit. At driveways, there’s a ramp down and back up again. I have no doubt the cycle tracks will attract new bicycle commuters. But design tweaks are needed for all levels of cyclists. For example, left turn exit ramps need to be placed so that people can move left across arterials to make left turns. Maybe few riders will do that at peak—but at other hours when the road is empty they will. And designs that include on-street car parking should be reconsidered. Obstructing visibility between people driving and biking is not a low-stress design (though eliminating the risk of dooring is a huge boon). These are points the bicycle work group brought up at a recent meeting for the Transportation System Plan revision. It’s excellent that bicycles as transportation are fully included in the system, and that bicyclists are being consulted. That will result in better facilities, er, down the road. And I’m grateful to the planners who met with me, to share the information that I’m now sharing, and to listen, and reassure. “We’re designing with the goal that shorter trips can be made on bikes or bus. Those 1-3 mile trips ought to be able to be handled outside a car for those who are physically able,” said Choi. I wholeheartedly agree! And I hold out hope that plans for Imbrie will shift, from the widening for cars, to bike lanes for people living within five miles of the Imbrie grocery store. In Washington County as in Portland, people biking are, like salmon, finding their “streams” filled with the influx of autos being brought to our region. Allowing—even planning for!—an ever-increasing profusion of personal cars is like old Portland burying its salmonid streams under industrial garbage and gravel. That leaves just one obvious and essential way to preserve and build bikeable, walkable habitats. It has to do with whether we prioritize personal automobiles first, or closer to last, on our public streets. While reading at the EPA website, I came across a letter Governor Kate Brown’s administration sent in support of the 2015 Clean Water Rule, at risk of being replaced. That’s sort of like Hillsboro’s newest bike facilities. For now, they’re pretty intermittent. But even if all our best new biking facilities are not yet interconnected, they serve an important purpose; they’ll help “rear” our newest bike-commuters. And even one more family going without a car is something to celebrate. Walkable Bikeable Counties for all!